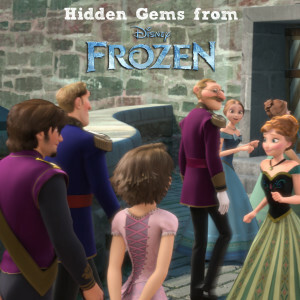 These Hidden Gem images from Disney’s FROZEN were just too fun to keep to myself. Check them out below and let us know in the comments if you spotted them yourself! WELCOME TO ARENDELLE – Elsa’s coronation draws guests from far-away lands—and movies. 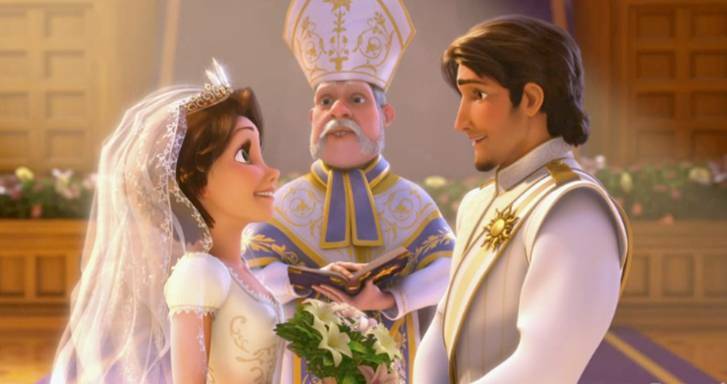 From “Tangled,” Eugene Fitzherbert aka Flynn Rider and Rapunzel even made the guest list. IT’S A MOUSE! – Disney’s famous icon makes the quickest of cameos in “Frozen.” A small Mickey Mouse plush sits on one of the lower shelves in Wandering Oaken’s Trading Post and Sauna. REPURPOSED PAINTING – Artist Lisa Keene’s painting—completed during the development phase of “Tangled” and based on “The Swing” by Jean-Honoré Fragonard—made such an impression on “Frozen” filmmakers, it became part of Anna’s signature song, “For the First Time in Forever,” when she leaps into the air and mimics the painting’s pose.